Choosing a venue can be confusing, but here at the Spotted Dog we have a lovely old15th century pub where you can hold that special event. From flower arrangements to table decorations we work hard to insure your event runs smoothly. 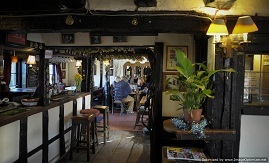 Whether a birthday,family party or christening this stunning 15th century pub is the perfect venue. For any further information on any function please call Louise 01892 870253. Dogs of the well behaved variety are welcome in bar area ONLY or outside, a phone call to notify us that you are bringing your pets would be appreciated so we can seat you in the appropriate area. The inside of The Spotted Dog is split up into a number of small areas,our resturant can seat upto 35 people which can booked for special occasions ; in total we can seat around 65 diners. There are three open fireplaces, perfect for those cold winter evenings. During the warmer days, our garden is the perfect place to while away a few lazy hours in the sun. We have three terraced seating areas to the front and rear where you can catch the sun at most times of the day. Plenty of umbrella's for those that require some shade. Our car park can accommodate around sixty cars. The Times recently named Penshurst Farmers’ Market in its Top Ten markets in the UK. With over 30 stalls offering the best local food and drink, and set against the wonderful backdrop of Penshurst Place, the market has a loyal following, as well as appealing to day trippers. The stalls provide a huge variety of fresh, local and healthy produce for your everyday needs, for treats, for a picnic or as a gift. Particularly popular are our fresh fish and seafood; free-range meats and game; bread; deli products and ready-to-cook curries; cheese; beer and fruit juices. You’ll also find fruit and vegetables, chutneys and jams, cakes, soups, fudge and plants. The market takes place on the 1st Saturday of every month from 9.30-noon, and has lots of free parking, and easy wheelchair access.